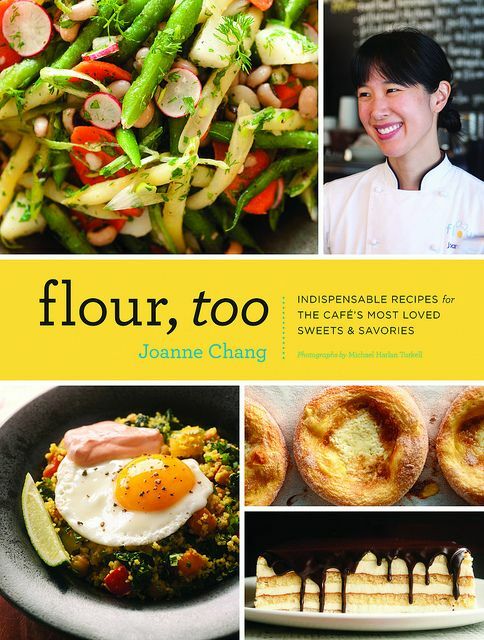 Today: Joanne Chang, author of the upcoming Flour, Too cookbook, doles out some career advice and shares a Boston Cream Pie recipe from her beloved Flour Bakery. 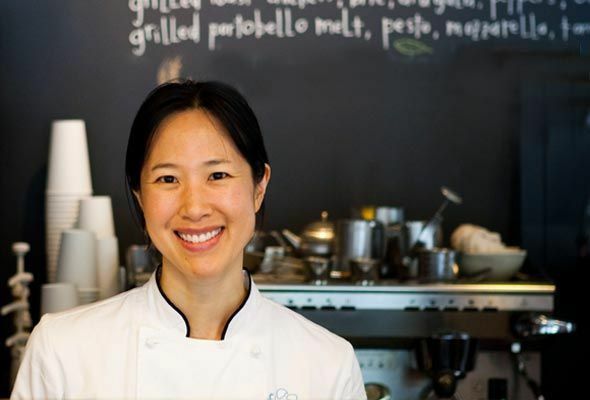 In her first cookbook, Flour, Joanne Chang shared recipes for many of the baked goods that have built a devoted following at her Boston-area bakeries. (Fun fact: Merrill used to work at Flour!) Now, there's a second book -- born not so much out of obligation as by demand. Flour, Too is Joanne's response to her customers' cries for the recipes behind their favorite items, from Cinnamon-Cream Brioche to roast beef sandwiches to a festive Bûche de Noël. Recently, Joanne stopped by our offices to chat about her new book: how it came to be, what her favorite recipes are, and how tricky it is to explain the process behind Croquembouche. Read on for her advice on breaking into the food industry, as well as a recipe for Boston Cream Pie from Boston's most beloved bakery. You've said that being a part of the neighborhoods surrounding your bakeries is very important to you. Do you think that sense of community is part of what drove you to write this second book? I think that the regulars who come to Flour start to think of the menu as theirs. And the way people talk to me -- I feel like the Food52 community is similarly passionate -- they're so into it that they will write me emails or stop me in the bakery. It's as if they're investors, saying "do this! and do this! and do this sandwich without this!" So I feel like the second book was more focused on what they love and why they come visit us every day. I want them to be able to replicate their favorite things at home -- especially those people who have moved away and miss their favorite foods from Flour. How did you decide which recipes to include? We've been open for almost 13 years, and I know what we sell a ton of. After the first book came out, so many people emailed, or texted, or tweeted us to say they loved the recipes in the book, but "what about this recipe"? For the most part I didn't even think about savory recipes [in the first book], so this book is half sweet and half savory. There were some sweet recipes that I had forgotten about too, like the Boston Cream Pie -- and then people are clamoring, "Oh no, we need the BC pie!" So when my publisher asked me if I wanted to do another cookbook, after hearing from all of these people, I realized I could do a whole other Flour book, which I didn't think existed until I put pen to paper -- and I saw how much there was to write about. What do you say to people who reach out to you wanting to break into the food industry? For people who want to open a bakery, the easy and the most helpful answer is that if you really want to do this, you have to commit to spending some time working at a bakery. Because if you don't like working in a bakery, you won't be happy opening one. I tell them to find a local bakery or restaurant that they like, and volunteer there. It's tough -- not everyone can work for free, but it's the easiest way to get your foot in the door and see if you like the environment. Or, get a part-time job so you can witness what the day-to-day work is like. You must be insanely busy. Do you get to cook a lot at home? I don't. I miss cooking at home, but because of our restaurant, a lot of times I'll be at the bakery during the morning, take a two hour break in the middle of the day, and then go to the restaurant at night. [My husband] Christopher and I get take out from there about 5 nights a week. But the food's good -- it's delicious! What recipes from the new book are you most excited about? The egg sandwich -- that was the one item where people would physically stop me in the bakery when the first book came out, like "where's the egg sandwich?" The chicken, jicama, and avocado sandwich is my personal favorite: we dress it with a little bit of honey and lime and make a spicy avocado spread. It's sort of like a guacamole, but chunkier and without tomatoes. What I'm really excited about -- and I'm really excited to see if people actually do this -- is our recipe for Croquembouche. You make the puffs, put it all together, and make the spun sugar -- I spent so long trying to take what's a simple task to me and break it down and figure out how to explain it in words. Making spun sugar is like tying your shoe -- once you've seen it and tried it, you can do it, but explaining it is difficult. I hope people will make it! Want to get a taste of Flour, Too before the book comes out June 4? 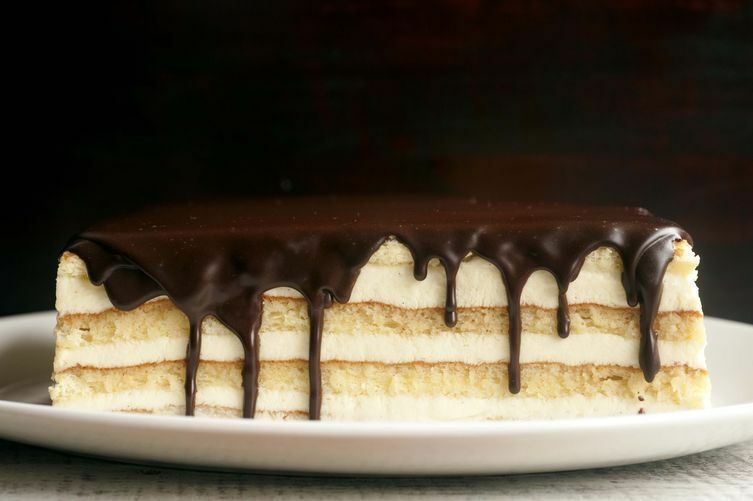 Joanne has shared her signature Boston Cream Pie recipe with Food52 -- and we can't wait to give it a try. Sorry but who is this Merrill who used to work at flour? My daughter wanted me to prepare this recipe for her birthday after browsing through Joanne's book - flour, too. Although it had a lot of steps, I spread it out over 3 days which was perfect. The instructions for the sponge cake had us in a disagreement, I thought it was 4 yolks and 7 whites and she thought it was 4 yolks and 3 whites. I was thrilled when I googled the recipe and found Joanne's answer here to someone else questioning that as well confirming it was 4 yolks, and 7 egg whites. The recipe turned out perfect and delicious. After trying it just 3 hours after defrosting the coffee flavor was a bit strong for us, but then leaving it overnight in the refrigerator mellowed the coffee flavor, dispersing it throughout the cake so it was almost not even noticeable - but heavenly tasting. We then proceeded to gobble up the cake. It was delicious and well worth the effort. I recommend it to anyone loving Boston Cream Pie to make this. I can't wait to try some of her other recipes and especially the pecan rolls in her first book. That's on my list for next time. Thanks Joanne, this made my daughter very happy for her 24th birthday! The first Flour book was a good one and I have a strong feeling the second one will be great. I love this updated presentation on the Boston Cream Pie! Haven't had - or even seen - Boston Cream Pie in years, but that (and Blackout Cake) are like bakery icons from my childhood. There were a few in NYC that made it back then too, and my mother would bring one home as a special treat...in fact, I think I'll make this recipe for her. Thanks for the very happy memory. I had a hard time adjusting to Boston when I first moved there, but Flour was one of those places that always cheered me up. Now that I've moved away, I pine for it (especially the chocolate brioche!). Can't wait to buy the book. Oh man. That Boston Cream looks orgasmic. I'm one of those people who moved away and desperately misses my weekly lunch I would allow myself at Flour (the rest of the time I tried to be good about bringing lunch from home). So does my husband, actually! I have the first Flour cookbook and love it - we especially make the macaroons and the raisin pecan bread. Looking forward to the second one. The chicken avocado and jicama sandwich is the BEST! You had me at croque......its on my bucket list. The BC pie looks delish, especially since I've never tried one. Indeed, I've lived. Thank you for sharing a bit of yourself with us, and inspiring many! It's on my bucket list too! I'm thinking around the holidays, when I have an occasion to make something really shockingly fancy. Me too.... I have a big birthday coming up but that's two years away :-). I'll have to look for another soon!